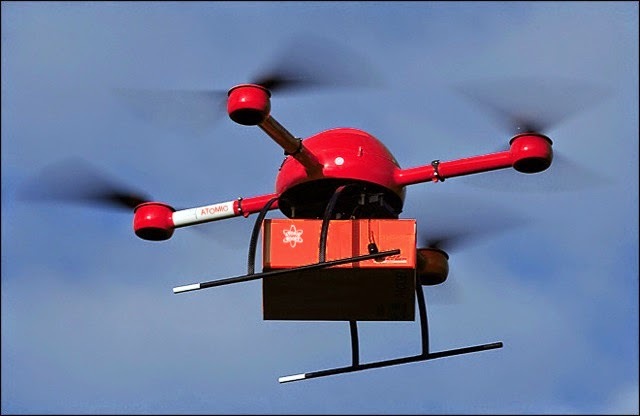 In the fourth quarter of 2013, online mega-retailer Amazon startled many Americans when it announced its intention to violate public airspace and use its own unmanned drones to deliver tchotchkes, gizmos and gadgets, quickly, cheaply and dangerously. Atomic Books owner Benn Ray says, "Once we heard Amazon's plans, we immediately began working with our drone-enthusiast friends to launch a fleet of Atomic Books drones as quickly as possible. And we're very pleased to announce the first of these will take to the Baltimore skyline today, with dozens more scheduled to come online by the end of the third quarter of 2014."